Buying unloved stocks is part of the DNA at Forager. Most of the funds’ excess returns over almost eight years have come from buying stocks that other investors hated at the time we acquired them. Think Service Stream in 2013 or Cardno in mid-2016. One simple way of finding these types of investments is to filter the market for stocks that others have been aggressively selling. Most value investors are regularly looking at a list of stocks trading near their 52-week lows or stocks that have fallen 40%, 50% or more from their highs. Lists like these focus our attention on stocks and sectors where others are more likely to be fearful. For us it can be time to be greedy. Does buying the bombs work? If you test this as a broad strategy, however, there is little evidence to suggest it works. 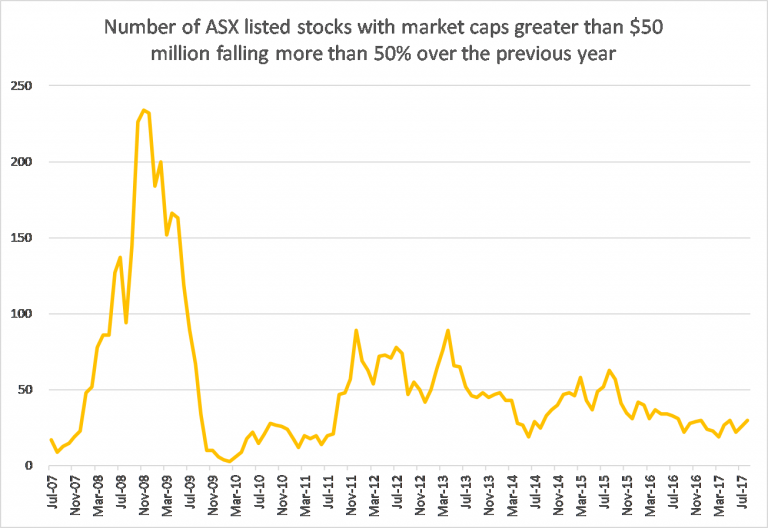 Take ASX stocks with a market capitalisation over $50 million which had fallen more than 50% over the past year. Simply buying an equal amount of each stock on this list every month nets the investor a loss of 77% over 5 years. More than three-quarters of your money dusted. And these were years in which Australian stocks rose over 10% annually. Over the past 10 years this list would have done even worse, losing over 90%. But some periods stand out. It will surprise no one that late 2008 and early 2009 was a great time to be looking for bargains. At the time, there were more than 200 ASX-listed stocks which had more than halved over the previous year. Bankruptcies and desperate capital raisings filled the front pages. Investors were scared. This brought with it the chance to buy stocks very cheaply. CBA shares were selling for $25 a piece. Wesfarmers‘s stock touched $15. Many smaller companies saw their share prices fall much further. Fast forward to 2012 and early 2013 when investors were again able to choose between 50 and 100 big decliners. Miners and the companies that service them dominated the list. In 2015 investors had another 50+ stocks to choose from. Miners and mining services were still suffering. Non-mining names like WPP (the old STW Communications) and Metcash also began to pop up. Many of the past year’s best performers for the Forager Australian Shares Fund were acquired during this period. As a general rule, then, the time to be sifting through the list of fallen angels is when there are many of them. At the end of last month there were 30 stocks which had fallen 50% from their highs in the most recent year, some of which were highlighted on a slide in our recent roadshow presentation. The list included former high flying telcos TPG and Vocus, drug maker Mayne Pharma, and media monitor Isentia. Thirty stocks is a much lower number than the historical average and that is perhaps why there isn’t much to get excited about. Even after halving most do not appear overly cheap. In optimistic markets, fallen angels are fallen for a reason. Food for thought, thanks Alex!